I decided to try and write a blog about a new piece of terrain as I work on it. This may end up boring people but I just wanted to see how it works out. So with Sevendust blaring from my computer speakers, I proceed! 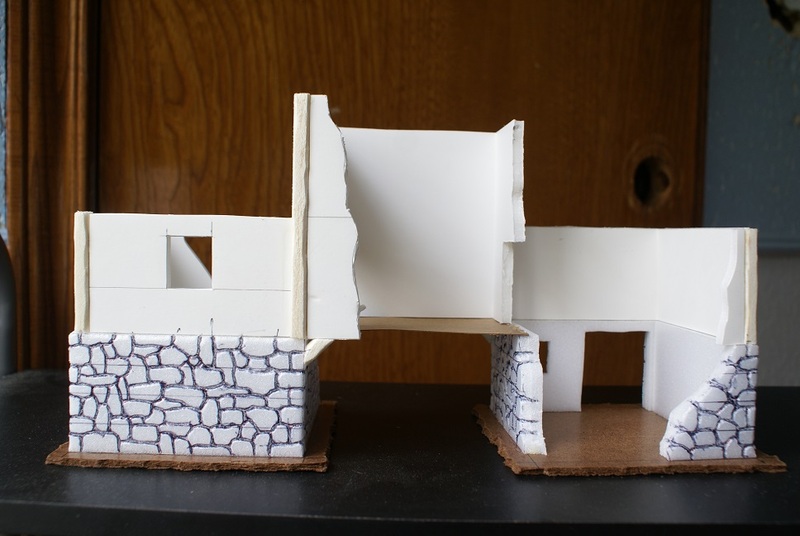 This is a terrain project that I actually started several months ago but with the birth of my son in early January, and us moving back to Austin from the dreaded city of Houston after that, pretty much every thing else got put on hold for a while. Now that we are getting settled back in and I am preparing to resume gaming with my old group, I am feeling inspired to finally finish this piece. This building is pretty much my take on the “bridge house” from the Mordheim “Blood on the Streets” terrain pack. 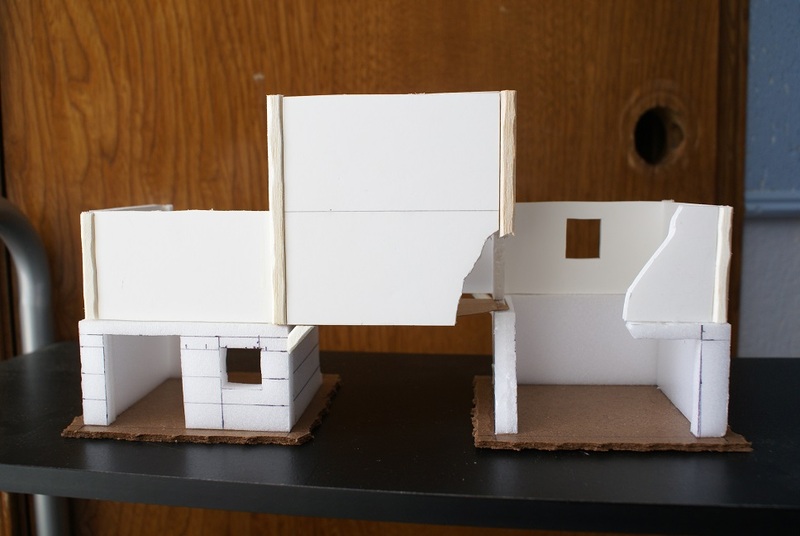 I always thought the idea of the building was cool but I hate cardboard terrain so I decided to give it a go on my own. I am working from memory on this one since I have not seen the actual building I decided to copy in probably five years or more. The design is fairly obvious, it is basically three independent sections joined together to make one building with an open walkway through the center. I used a thicker foam for the bottom level because I wanted to do a brick pattern of some sort, carved into the foam. Originally I wanted to do uniform bricks which is why there are straight lines drawn in the foam, but I later decided to try a more randomized rock design. It was more labor intensive but I like the result better this way. 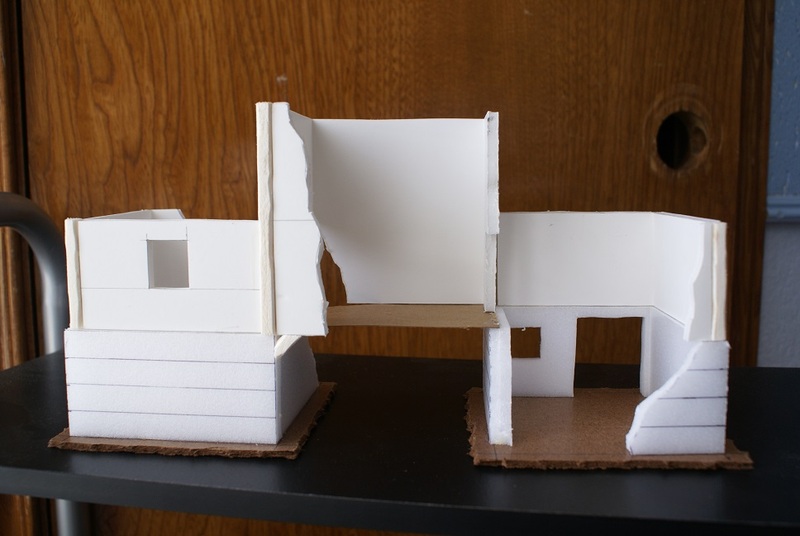 The base is made from hardboard as usual, and the upper sections are foamcore with balsa wood corner posts. 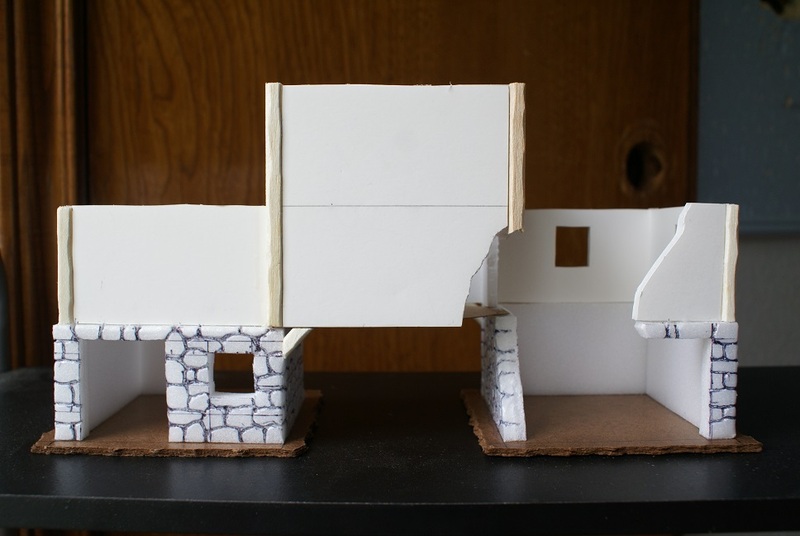 The two side sections will get pitched roofs added(with appropriate damage) and the center portion will have a flat “terrace” style roof for minis to rain death down from, giving the building four levels tabletop goodness! The “stones” of the bottom level were drawn out with a ballpoint pen and then carved into the surface by simply pressing harder with said pen. I also then pressed in random stones with my finger to give the surface a truly random appearance. The devil is in the details! It should texture and paint up nicely when done. That’s all for now! Comments welcome!